Your data is one of your most valuable assets. It gives you the power to analyse, compare and act. And to help you make better, data-driven decisions, we’ve made your data on Music Glue more useful. You’ll now see your data right in front of you on one, easy-to-scan dashboard. Compare campaigns and time periods and plan ahead without ever having to open a spreadsheet. If you manage multiple stores on Music Glue, you can access Enterprise Insights which pulls all data from all stores into one place. As well as insights for each store on an individual level. View all your merchandise and music sales on a single dashboard at the click of a mouse. It includes digital, experiences and fanclub too! Not tickets, just yet. Dig into individual products - Work out which t-shirt size sells best in which country and when you need to reorder. Enterprise version if you manage multiple stores – View all of your stores and products from all every account on a single dashboard. No need to be logging in and out! Work out where your fans are and how they like to interact with you and your store. View your top selling products - Understand your best selling products and how much revenue they generate whilst watching the speed that new releases sell. Compare sales across a weekly, monthly or custom time period - Handy if you want to compare the latest album campaign to the last one. View a full breakdown of sales by country - understand where your fans are and use this to plan marketing campaigns, tours or even press. Understand more about your fans and their behaviour. Return rate and breakdown of new vs. old customers - See how many new fans are joining you on your store vs. your older fans. Watch as your fan base grows before your eyes! Login to Music Glue. 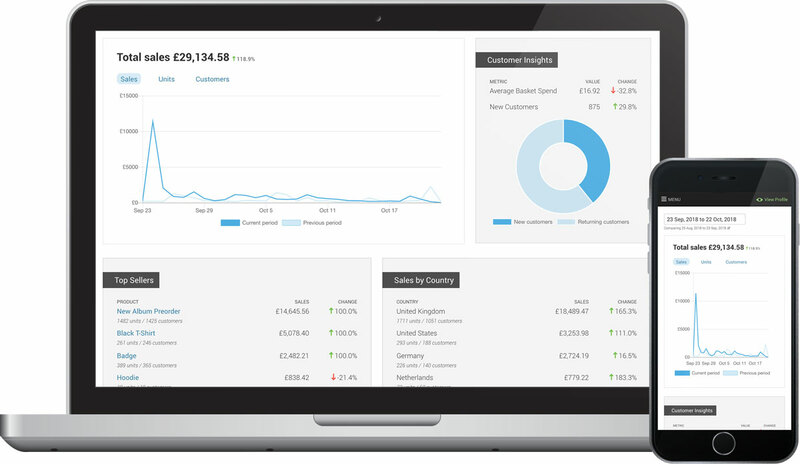 You’ll see your insights dashboard straight away! Do you manage multiple stores? If so, the default view when you login is your Enterprise Insights for all your stores. View insights for individual stores by selecting that store from the navigation bar. As always, if you’ve got any questions, just get in touch via support@musicglue.com.